Alright you guys, Memorial Day is one week away, do you know what you’re making? No? Fear not, I have you covered! 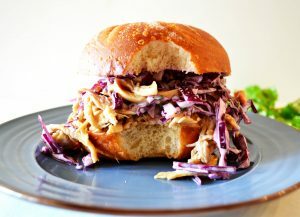 You’re making these Teriyaki Pulled Chicken Sandwiches with Mango Slaw. 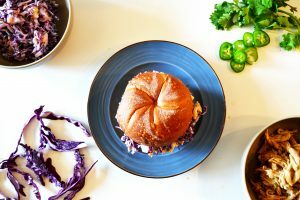 They’re perfectly salty from the teriyaki sauce, sweet and juicy from the mango, crunchy from the purple cabbage, all stuffed between a steamed, soft bun. Can’t you just envision sinking your teeth into it? At which point your say, mmmmmm this is so delicious. 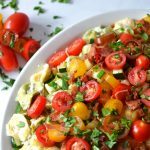 Don’t worry, I can take this one step further for your laid back, easy breezy Memorial Day – it can ALL be prepped in advance. You see you’re off socializing, playing with your kids, kicked back in your hammock soaking up the sun. What you are not doing? Slaving over a stove. Winning! I mean, look at those colors! They say Memorial Day is the unofficial kick off to Summer, and does that bowl above not say par-tay??? This Mango Slaw can be made the day before, heck even two days before and sit in your fridge, flavors melding, crunch maintained. One note however, the purple cabbage will likely die your other ingredients a shade of purple, but who cares? You’re stuffing it on a bun, we’re going for delicious simplicity here. Mango not your thing? Who are you? No seriously, pineapple would be equally delicious in this recipe and an amazing substitute, especially if you’re say shopping at the last minute and the grocery store doesn’t have any ripe mangoes. It could happen, don’t panic, grab the pineapple. You’re welcome. Let’s talk side dishes. I’m thinking potato salad, pasta salad, regular ‘ole lettuce salad, veggie tray, chips, hummus- should I keep going? 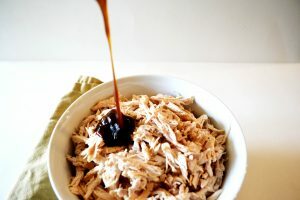 Here is the pulled chicken in all it’s about to be smothered in teriyaki glory. You want the chicken covered in teriyaki sauce, but not swimming in it. I would add some, mix and taste. You can always add more. Leftover chicken? I’m thinking a salad with almonds and oranges or a pizza with peanuts, cilantro and jalapenos. 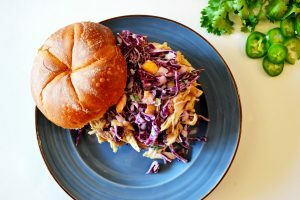 Trust me guys, you’re guests and family are going to love this teriyaki pulled chicken sandwich with mango slaw. 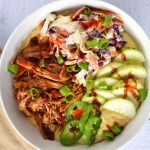 It’s an amazing variation on all things barbecue and I repeat, it can be ALL be prepped in advance. I don’t know about you, but when I’m having a get together, I do not want to be cooking, I want to be hanging out. Let’s have an internet cheers to you’re unofficial start to summer and happy, fun family and friend get togethers to come. Cheers! Ingredients: Makes 6-8 sandwiches, depending on how full you stuff them! Preheat oven to 400 degrees. Brush both sides of the chicken with olive oil and salt and pepper. Pour just enough chicken broth to lightly coat the bottom of a baking dish and place chicken in the dish. Cover with aluminum foil and bake for 30 minutes, or until chicken is cooked (the juice runs clear when cut). Let the chicken cool and then shred with two forks. I also used my hands to shred the chicken into the desired size. While the chicken is cooking, make your slaw. 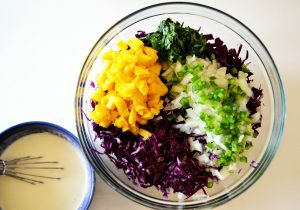 Combine cabbage, onion, jalapeno, mango and cilantro in a large bowl. In a separate bowl whisk together the mayonnaise, vinegar, salt and pepper, and sugar. Pour over the bowl containing the cabbage and other ingredients and stir to combine. Next, if you want your buns warmed up, heat your oven to 350 degrees and cover them with aluminum foil and put them in the center rack of your oven. Keep an eye on them periodically so they do not cook too long and become hard. Now you can begin making your teriyaki sauce. Put all ingredients in a saucepan, whisk together and bring to a boil. Whisk constantly to your desired consistency. Be careful the sauce does not burn. Remove from the heat. If you want a thinner sauce, add more water. If you want a sweeter sauce, add more coconut sugar, but in keep in mind the flavor will be spread across all of the chicken. I added the optional one tablespoon or brown sugar to mine as it was a bit too salty at first. but taste your’s first and adjust as desired. 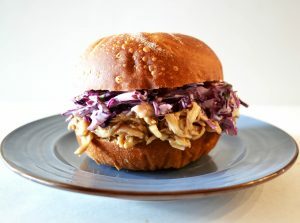 Pile chicken then slaw on a bun and eat! We added sliced jalapeno to our sandwiches and it was delicious. If you like a little heat, I strongly recommend it. Teriyaki sauce inspired from here. Welcome to Preapare to Eat! This site is dedicated to delicious food. 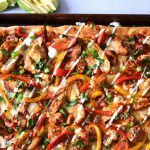 Check out our recipe section to find appetizers, lunch ideas, entrees, desserts, and cocktails - we have it all!